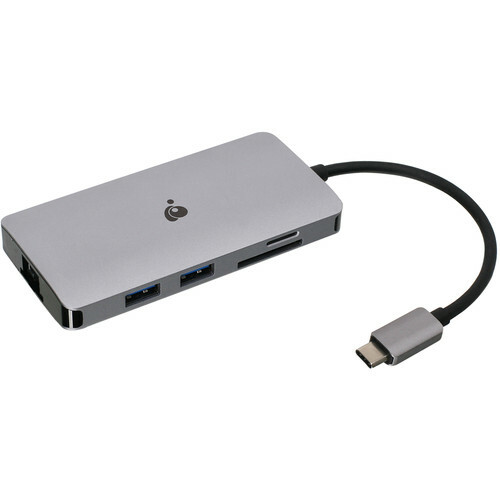 Built for mobile professionals using a rugged aluminum housing, the USB 3.1 Gen 1 Type-C Travel Dock from IOGEAR allows users to connect to a variety of USB 3.1 Gen 1 Type-C, USB 3.1 Gen 1 Type-A, Ethernet, HDMI, SD, and microSD peripherals to their compatible Windows or Mac system. This dock connects to your host system using an integrated USB 3.1 Gen 1 Type-C cable that supports Power Delivery 3.0 and is also compatible with Thunderbolt 3. IOGEAR's dock features three USB 3.1 Gen 1 Type-A ports; one of those ports supports BC1.2 fast charging at 1.5A, one USB 3.1 Gen 1 Type-C port that supports Power Delivery 3.0, one UHS-I SD card reader, one UHS-I microSD card reader, one Gigabit Ethernet port for network connectivity, and one HDMI 1.4 port that supports a maximum resolution of 4K x 2K @ 30 Hz. Please be aware that your system must support DP Alt Mode to use additional displays. IOGEAR's USB 3.1 Gen 1 Type-C Travel Dock expands the connectivity of your laptop or tablet's USB Type-C port. Travel lighter with this portable, 8-in-1 dock and leave your bulky accessories at home. The dock is equipped with a USB Type-C power charging pass-through port, three USB 3.1 Gen 1 Type-A expansion ports, a Gigabit Ethernet port, an SD/microSD card reader/writer, and a 4K HDMI port. Attach your laptop or tablet's original USB Type-C AC charger to the dock's USB Type-C port to deliver up to 100W of power to all dock-connected devices. Extend your viewing workspace by adding an HDMI monitor for a more complete visual experience. The Travel Dock supports up to 4K resolution video for sharp and crystal-clear images. Read and write both SD and microSD card content and efficiently transfer full-resolution photos, documents, and videos between mobile, computer, and external storage devices. Expand your laptop or tablet's USB Type-C port with three USB 3.1 Gen 1 Type-A ports. Use your existing USB peripherals like keyboards, mice, printers, or hard drives with your mobile device. The Travel Dock is capable of transferring pictures, video, and music at data rates reaching 5 Gb/s and is backwards compatible with USB 2.0 and 1.1 devices. Fast Role Swap is a feature in the USB Power Delivery 3.0 specification which ensures the docking station will maintain power anytime it drops below a set threshold, such as while unplugging the USB Type-C power adapter from the dock or during an unexpected loss of building power. This feature provides a smooth, safer operation of connected devices, so your work does not get interrupted. Box Dimensions (LxWxH) 5.9 x 5.4 x 1.8"
USB 3.1 Gen 1 Type-C Travel Dock with Power Delivery 3.0 is rated 3.3 out of 5 by 3. Rated 2 out of 5 by Gidel Q. from HDMI won't work with my Dell monitor I bought this product in the hope of using it with my Macbook Pro 15" (2017) and my Dell monitor (U2417H) but the HDMI did not work. The monitor connected a few times but after a while it lost the connection. I try use another HDMI cable but it did not work. I contacted the IOGEAR support and they told me to follow an order: First plug the Monitor - Power Supply - Dock to MAC. But this did not work either and I do not want it necessary to have an order of action to make a monitor work. Try another brand!